274 pages | 1 B/W Illus. This book offers an accessible overview of the role sport plays in international relations and diplomacy. Sports diplomacy has previously been defined as an old but under-studied aspect of the estranged relations between peoples, nations and states. These days, it is better understood as the conscious, strategic and ongoing use of sport, sportspeople and sporting events by state and non-state actors to advance policy, trade, development, education, image, reputation, brand, and people-to-people links. 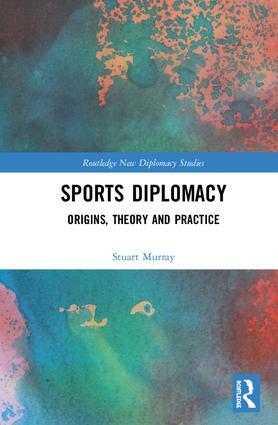 In order to better understand the many occasions where sport and diplomacy overlap, this book presents four new, inter-disciplinary and theoretical categories of sports diplomacy: traditional, ‘new’, sport-as-diplomacy, and sports anti-diplomacy. These categories are further validated by a large number of case studies, ranging from the Ancient Olympiad to the recent appearance of esoteric, government sports diplomacy strategies, and beyond, to the activities of non-state sporting actors such as F.C. Barcelona, Colin Kaepernick and the digital world of e-sports. As a result, the landscape of sports diplomacy becomes clearer, as do the pitfalls and limitations of using sport as a diplomatic tool. This book will be of much interest to students of diplomacy, foreign policy, sports studies, and International Relations in general. 8. Non-state Sporting Actors: Negotiation, Intelligence Gathering and Dissemination, and the Minimisation of Friction. Stuart Murray is an Associate Professor at Bond University, Australia. He is also a Fellow of the Academy of Sport at Edinburgh University, UK and Associate Editor of the journal Diplomacy & Foreign Policy. This new series publishes theoretically challenging and empirically authoritative studies of the traditions, functions, paradigms and institutions of modern diplomacy. Taking a comparative approach, the New Diplomacy Studies series aims to advance research on international diplomacy, publishing innovative accounts of how “old” and 'new' diplomats help steer international conduct between anarchy and hegemony, handle demands for international stability vs. international justice, facilitate transitions between international orders, and address global governance challenges. Dedicated to the exchange of different scholarly perspectives, the series aims to be a forum for inter-paradigm and inter-disciplinary debates, and an opportunity for dialogue between scholars and practitioners.